A great tour of Vietnam, you will see amazing sights, visit ancient Buddhist monasteries, enjoy the cultural interaction and come home with a rich experience. Shop for silks and gems all at bargain prices. Welcome aboard your flight to Saigon. Enjoy onboard world-class hospitality. Arrive Hanoi at Noi Bai airport and transfer to Prestige hotel. Your Vietnam tour begins. 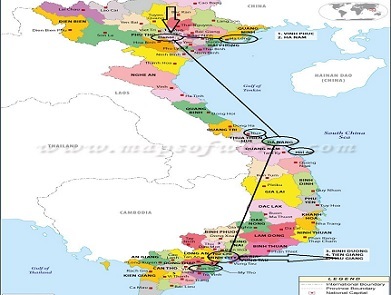 You will take a city tour to Ba Dinh Square and Ho Chi Minh's Mausoleum, his house on stilt. Visit the architectural and historical aspects of Uncle Ho's final resting-palace. In the area you will visit Ho Chi Minh's house on stilts where he used to live. Lying to one side of the Mausoleum is the One Pillar Pagoda; built by King Ly Thai To in 1049, the structure has become an important symbol for the people of Hanoi. In the afternoon, continue to visit the Temple of Literature. Then you explore the Old Quarter of Hanoi by a relaxing cycle tour through the Old Quarter, also known as the 36 streets. This bustling area of narrow streets is home to literally thousands of small businesses and shopkeepers. Then you walk to Hang Gai Street - the silk shopper's paradise that you can have the best Vietnamese silk. It is a great place to explore with plenty of photo opportunities. Follow with the famous Vietnamese traditional water puppet show in the afternoon. After an early breakfast, you will be depart from your hotel to Ha Long Bay, one of the most spectacular UNESCO World Heritage Areas and the world's largest marine limestone 'karts' landscape. There you will board your boat, a wooden junk built from the model of the old Vietnamese court vessels with sails, a wide transom and rectangular superstructure, that will take you first to the World Heritage area and join some activities at the area if weather permits. All meals will be provided on board. Overnight on the boat. Enjoy the views of the bay and surrounding islands, you then continue the cruise in the bay while the meal is served. The vessel cruises leisurely back to harbor. On return to the wharf you disembark and transfer to Ha Noi for a flight to Da Nang. Upon arrival, transfer to Hoi An for check in. Overnight in Hoi An Trails. In the morning, you have a walking tour around Hoi An town with the narrow lanes lined with centuries-old houses influenced by Chinese, Japanese, French and European architectures and visit its numerous places of interest: the 400-year old Japanese Covered Bridge, the Phuc Kien Assembly Halls, the local fish market. Around the town, you can see a numerous art galleries and tailor shops, get some made-to order clothes if you like. Overnight in Hoi An. After breakfast, check out hotel and leave Hoi An for Hue, the cultural city of center Vietnam. The journey will be through the beautiful Hai Van pass, where scenery of the hills and sea will catch your attention. Arrival Hue in the early afternoon, you will take tour to visit the Forbidden Purple City, constructed under Emperor Gia Long's reign in the early 19th century. It is located inside the Citadel of Hue, which was badly damaged during the Tet offensive in 1968. Established as the capital of unified Vietnam in 1802, Hue was not only the political but also the cultural and religious center under the Nguyen dynasty until 1945. Hue was declared a UNESCO World Heritage in 1993. Then visit the characteristic Thien Mu Pagoda, located on a sloping pine hill with the front side facing the Perfume River, was firstly built in 1601 which its 21-metre-high tower of seven stories and refined bell are always the most beautiful sceneries of the ancient pagodas in whole country, and the highest spirit of Vietnamese. Overnight in Hue Indochine Palace. Free at leisure until transfer to the airport for a flight to Ho Chi Minh City. Upon arrival, transfer to your hotel and the rest of the day is free at leisure. Overnight in Ho Chi Minh City, Liberty Central. A morning drive will take you to visit the famous Cu Chi Tunnels. The tunnels are 75 km northwest of Ho Chi Minh City, an area that played an important role during Vietnam's wars for independence and reunification. More than 200 km of tunnels are built here by the Vietnamese guerrillas are often the highlight of South Vietnam touring. You can explore the bedrooms, meeting rooms, air-raid shelters, smokeless kitchens, and experience life underground in this extraordinary tunnel complex. In the afternoon, take a city tour to visit of the Reunification Palace, the former residence of the presidents of South Vietnam, before 1975. Visit the nearby City Post Office, the Notre Dame Cathedral. Final stop is the lively Ben Thanh Market, an ideal place for shopping. Overnight in Ho Chi Minh City. You will travel to Ben Tre. Upon arrival, enjoy a boat cruise along the river which is a branch of the Mekong. Take a short walk to a various local workplaces where you have a picture of how the local works, including a visit to the brick kiln, the fruit orchards, a coconut candies workshop and other coconut products by the local cottage industries. The boat will then stop at a quiet village where you can have a short walk to experience the village life, visit a mat weaving house, where straw mats are woven by hand - you can even have a go at weaving yourself. Take xe loi (a kind of motorized rickshaw) to a riverside local restaurant for lunch. After lunch, it is time to board a sampan for a relaxing trip along narrow canals. Pick up your bike and start cycling through the orchards to Mr. Khanh's house. Khanh is a passionate antiques collector and his house is jamming packed full of fascinating artifacts from Vietnam and elsewhere in Asia. He also has some fascinating family albums dating back to French colonial time. You will then get on your bike and cycle back to the river to board your boat and return to the dock, back to Ho Chi Minh City. Overnight in Ho Chi Minh City. Transfer to the airport for homeward bound flight.